When the ugly truth is reported about Obama's massive tax increases ready to crush the middle class the White House spares no energy in pressuring Reuters into pulling the story. 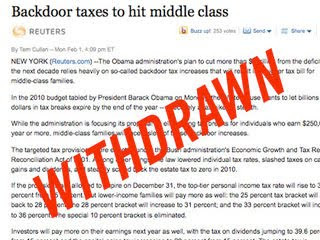 The news service Reuters withdrew a story last night titled "Backdoor taxes to hit middle class" after the White House reached out and pointed out "errors of fact." The story, which claimed the White House's deficit reduction plan relies on raising taxes against the middle class by allowing tax cuts to expire, was withdrawn at about 8 p.m. Monday, according to Yahoo timestamps. The original story ran at 4 p.m. The withdrawal promises a replacement story later this week. "The story went out, and it shouldn't have gone out," said Courtney Dolan, a spokeswoman for Reuters. "It had significant errors of fact." She would not elaborate on the specific errors, but said Reuters will "address those specific points that were incorrect." "The White House did contact us and point out errors of fact," she added. So if there are errors, how come the White House has no comment? Apparently, the White House thugs haven't gotten to the folks in Canada. I don't understand why Obama is so upset with Reuters. It's not as if they mentioned the $4 billion in his budget going to the criminal enterprise known as ACORN.